I have finished the stocking that I was working on last week. When it came to the embellishments I liked the way the Santa Button looked and a bit out of character for me who likes lots of embellishments I thought that the Santa Button was all this one needed. 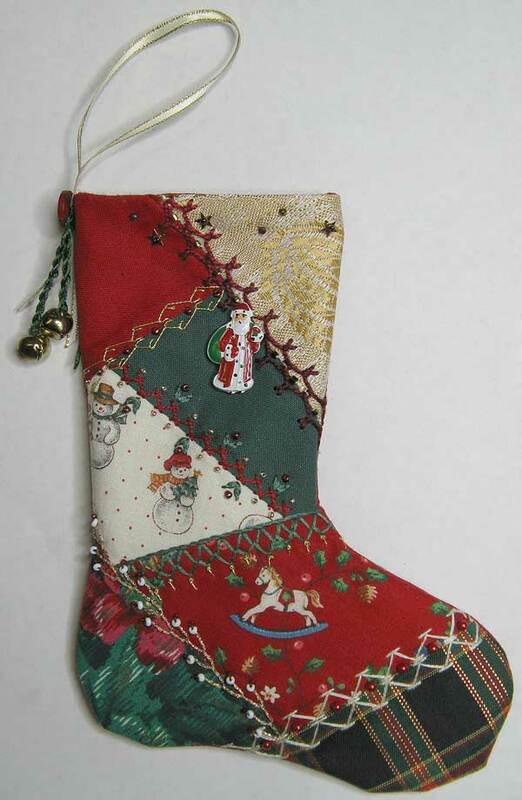 See this post of how to construct a christmas stocking. Keeping with the simplisity of useing minimal embellishment instead of putting lace around the top I have used a few stars and beads to hold the lining in place so that it doesn’t creep out over the top. 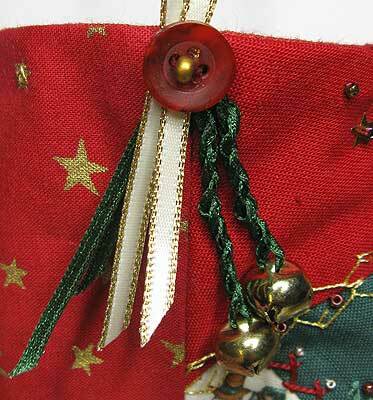 Still keeping the embellishments simple I attached the bells and hanger with a single red button and gold bead. It came out a very beautiful stocking! I think you are right about Santa. with the snowman and rocking horse, it looks so balanced to have him on there by himself. I also like your hanger. =) Very pretty overall effect. Very beautiful your stocking. I love the colours combinations and dall the stitches and details. Congratulations ! I like the stocking very much. Here in Spain, we do not have the tradition about the stocking, but I really love it and I do it much more if it is a crazy quilted stocking!